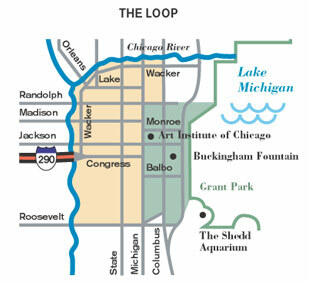 Chicagoans who live near the Loop have many different occupations and lifestyles, but they have one thing in common: Proximity to the heart of the city, where things are happening. East of Michigan Avenue and just south of the river is a neighborhood built on air rights above land once occupied by railroad yards. The New East Side, as it is called, offers high-rise condominiums, hotels and office towers with magnificent panoramic views in all price ranges. With a golf course, two marinas and Grant Park at their doorstep and the city’s great theaters and museums within easy walking distance, residents here make recreation and culture a way of life. Immediately south of the Loop, another area is being reclaimed from the great railroad yards, with hundreds of acres of open land sprouting new subdivisions. One such development is Central Station, east of Michigan Avenue at the south end of Grant Park. It features single-family homes, townhomes and condominiums surrounded by parks and playgrounds a short walk from the marinas and Museum Campus. Today, additional communities are being constructed, including the Heritage at Millennium Park.